Happy New Year! It certainly has been a while since our last post, which is ironic given that our holiday time is usually exploited for the sole purpose of food, cooking, baking, and dining. Indeed Jonathan and I did lots of the aforementioned activities over the past few weeks. I went on a Christmas cookie-baking bender, we tested out a new pizza peel and stone on a turbo-powered gas grill, dined like sustainable royalty at Chez Panisse, in Berkeley, CA, and even poked around at the Ferry Building Farmer's Market, in San Francisco (at which I had my first-ever taste of persimmon). Sadly, a camera never seems to be accessible when I'm at my most photo-worthy (wrestling a soon-to-be-brined turkey, dusted in flour at 1am after having baked 10 batches of cookies), so the subject of this post is not some decadent holiday treat (the Greek walnut cookies were my favorite! 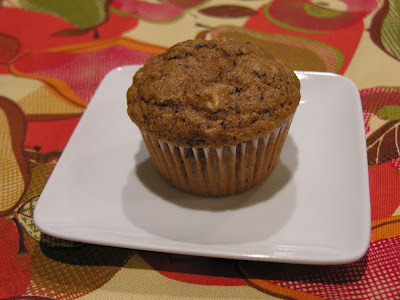 ), but a quick breakfast or brunch-time treat that works at any time of the year: banana walnut muffins. Naturally, these are no ordinary muffins - they are laced with 70% bittersweet chocolate and fortified with whole grains. Really, though, they are quite simple to make and just the right amount of sweet for a morning muffin (let's face it - most bakery muffins are just cake in disguise). The batch we made today was missing the walnuts, but they are good both with and without them. The chocolate, though, is a must. I am a strong advocate of finely chopping a chocolate bar as opposed to just adding chocolate chips - having fine shavings of chocolate incorporated into the muffin provides a nice, even, subtle chocolatey hit. A note about bananas - this recipe, like all banana bread/muffin recipes, calls for very ripe, smashed bananas. Instead of keeping old bananas on the counter, try freezing them as soon as they get nicely mottled and ripe. That way, you can make muffins when the craving hits - just take the frozen bananas out of the freezer an hour or so before you want to bake with them. I will warn you that frozen ripe bananas turn completely black when thawed, but don't worry - they will taste fine in whatever recipe you're making. Mix oats with buttermilk in a small bowl, and stir to moisten. Let soften for a few minutes. Meanwhile, grease and flour 12 standard muffins cups, or line with paper liners. Beat eggs with brown sugar until thick and smooth. Mix in banana, buttermilk/oat mixture, oil, and vanilla. In a separate bowl, whisk together flour, baking powder, baking soda, salt, and cinnamon. Mix into wet ingredients and stir just until combined. Add nuts and chocolate and stir a few times to incorporate. 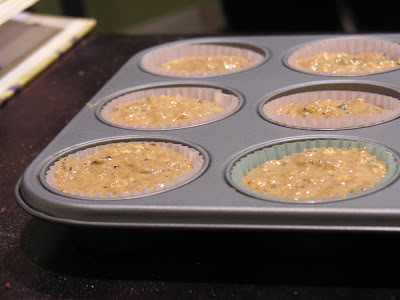 Pour batter into prepared tin and bake at 350F for 16-18 minutes, or until tops are firm and dry to the touch. 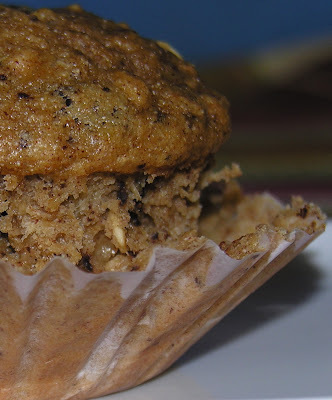 Chocolate-banana muffins for breakfast? Wow! I think they'd be perfect with afternoon tea, too. Will definitely bookmark this recipe. I love persimmon! I had it (them?) all the time in Israel.